The cracker on the right is a variation of crisp bread with the seeds on top. The recipe below is all seeds! This recipe is adapted from Oh She Glows Everyday by Angela Liddon. In her book they are called “Endurance Crackers”. They are packed with nutrients, flavorful, and calorie dense. Mix all of the ingredients together in a large bowl, adding the warm water last. Stir to combine. Allow the seeds to rest while they absorb the water. Oil three pieces of parchment paper. When the seeds have absorbed all of the water, divide the mixture between two pieces of parchment paper. Place the third piece of parchment paper oil-side down onto the mixture. 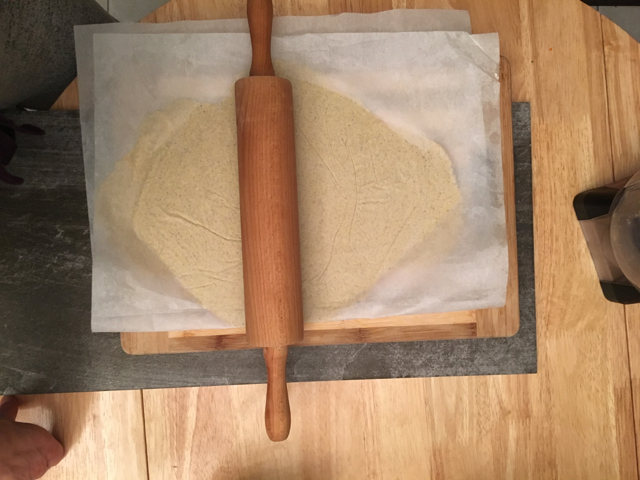 Using a rolling pin, roll out the mixture as thin as possible, 1/8-1/4 inch thickness. Repeat with the rest of the mixture. Slide each of the the rolled out crackers onto a cookie sheet and bake for about 30 minutes. Then using a spatula, carefully flip the crackers and bake for about 20 minutes or until they are golden*. Note that it is easy to burn these crackers so it is better to take them out early and rebake them later if needed. Allow the crackers to cool completely and then break them up into desired sizes. If they are not crunchy, put them back into the oven for a few more minutes. Store in an airtight container for one week. *At this point, you may want to tear the crackers up into large pieces to help them cook evenly. However, they are hot so be careful. These crackers can be made thin or smaller and thick. If they are thick, you’ll want to cut them out before baking. If you like, you can press seeds or spices into the top of the dough prior to baking. These crackers are delicate, rich, and crispy. I think of them as a fancier cracker but that doesn’t mean they are harder to make than other crackers—quite the opposite. This recipe was adapted from Smitten Kitchen; and their recipe was adapted from King Arthur Flour Whole Grain Baking cookbook. The glaze is delicious and recommended but they are also good without it. These crackers are delicious solo or served with dips or nut butters. Preheat your oven to 350F/ 175C. Place a piece of oiled parchment paper on the back of a cookie sheet. Spray a second piece of parchment paper. In a medium sized bowl whisk together the dry ingredients: the flour mix, oat flour, paprika, sugar, and salt. 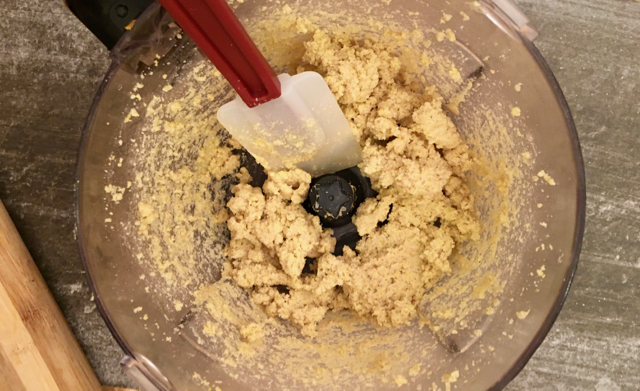 Work the cold butter or vegan spread into the mix using your hands, fork, or a food processor until the mixture resembles cornmeal with some larger pieces of butter. Start by adding 1 1/2 tbsp (or 20ml) cold water. You may need to add more. Add just enough water until the dough forms a ball when pressed together. You want the dough to form a ball but you don’t want it to be too sticky or too dry and crumbly. Place the dough on the parchment paper on the back of a cookie sheet. Place the second piece of oiled parchment face down on the dough and using a rolling pin roll the crackers out as thin as possible 1/8-1/4 inch. Slice the crackers using a knife or pizza cutter. Dock the crackers using a fork. If making the glaze, mix tougher the ingredients in a small bowl and using a pastry brush, brush the liquid onto the dough. Bake them for about 20 minutes until the edges brown or until they are lightly golden on top. Allow the crackers to cool completely before eating as this will ensure that they are crunchy. If the cooled crackers are not crispy, they can be put back into the oven and baked for additional time. Once cooled, store in an airtight container at room temperature. Crackers can easily be undercooked or overcooked so watch them carefully once they start to brown. You want them to be cooked enough to be crisp but not burned. You may need to remove the outer crackers midway through baking if they become too browned. The cracker on the right is a variation of crisp bread with the seeds on top. 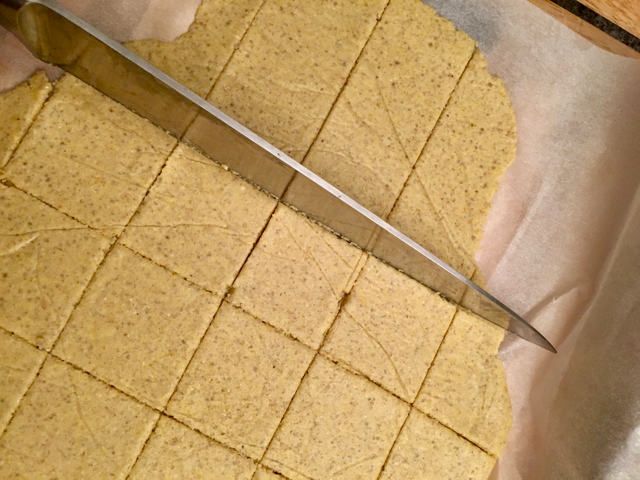 The cracker above is lighter in color than the cracker recipe below because the recipe calls for buckwheat. These crackers are super hearty, packed with nutritious ingredients, and covered in flavorful seeds. Preheat oven to 350F/180C. 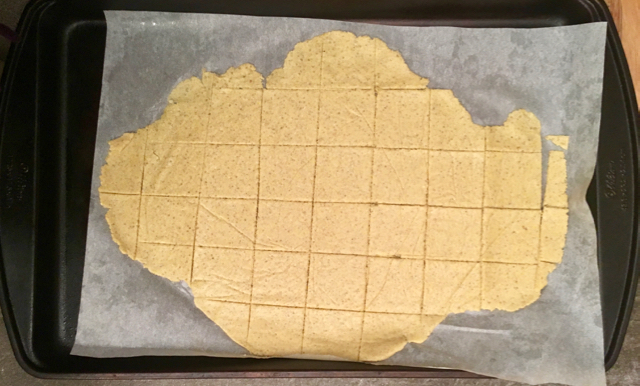 Place a piece of oiled parchment paper on the back of a 17 x 11 1/2 inch cookie sheet. Spray a second piece of parchment paper. In a large bowl mix together all of the flours, seeds, spices, and salt. Add the oil and mix. Then add the water. Start with scant 1/2 cup and mix, adding more if necessary, until the dough will form a ball when pressed together. The dough will be on the tacky side for cracker dough (it will feel a little sticky). Place the dough on the oiled parchment paper and place the second piece of oiled parchment paper face down on the dough and roll the crackers out as thin as possible 1/8-1/4 inch. Bake for about 20 minutes until the edges brown. Then flip the crisp bread over and break it up into five large pieces. Bake for about 15 more minutes, or longer if needed. Allow the crisp bread to cool completely before eating as this will ensure that they are crunchy. If the cooled crackers are not crunchy, they can be put back into the oven for bake and baked for additional time. Once cooled, store in an airtight container at room temperature. - For a more elegant cracker reserve about one third of the seeds and press them into the rolled out dough just before baking. I prefer to use roasted seeds, but this is up to you. The seeds on top will get roasted when the crackers bake. - Crackers can easily be undercooked or overcooked so watch them carefully once they start to brown. You want them to be cooked enough to be crisp but not burned. You may need to remove the outer crackers midway through baking if they become too browned. Make the square shape instead like in the photos below--much faster! These crackers are wholesome and delicious. They can be enjoyed plain, or served with dips, or spreads, like almond butter or vegan creams cheese. Put all ingredients, including the extra tasty ones if using (see note), in the food processor and blend until a dough forms. If there are still a few chunks of whole quinoa that is fine. Place the dough on oiled parchment paper and then place another piece of oiled parchment paper facedown onto the dough and roll out to about 1/8 inch thickness. Remove top sheet of parchment paper and use a knife to slice the dough. (At this point, you may sprinkle extra coarse salt on the top of the crackers if you wish.) Slide the parchment paper onto a cookie sheet and bake until the crackers are golden, about 20 minutes. Be sure to check the crackers as they bake so they do not overcook or brown. Allow the crackers to cool and enjoy! They are excellent with dips, or spreads, like almond butter or vegan creams cheese. Store the leftovers in an airtight container.